This Steering Linkage Kit replaces your factory tie rods and draglink in your 66-75 Ford Bronco. For 66 Broncos, you will need to update your pitman arm to a 67-75 style pitman arm for proper fitment of the draglink. This kit includes OE style driver and passenger tie rods and adjustment sleeve. It also features a custom adjustable draglink. Unlike the factory draglink, this adjustable version will allow you to lengthen or shorten it in order to center your steering box for full turning radius left and right. This option is highly recommended for any Bronco with a non-factory suspension height. 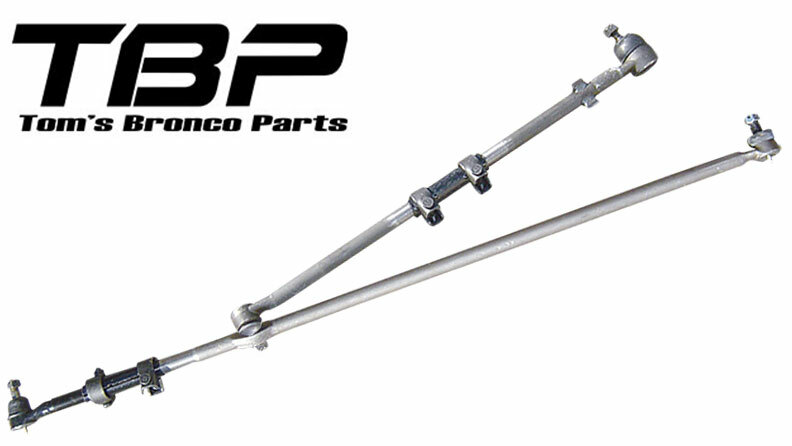 NOTE: This can also be used with '66 Broncos, but if it has the original pitman arm, it needs to be replaced with a 67-75 Large Taper style pitman arm, part number 6725 for stock height arm, or 6735 for Drop Pitman Arm.